Cameras have become a necessary equipment in an artist's bag and photos have become quite an indispensible tool especially when climatic conditions do not allow one to complete one's paintings outdoors. Although I know many artists do not like to use photographs for their paintings, I think this "evil" should be accepted as part of technology and the evolution of art form. In this book Patrick Seslar has shown how one can paint from photographs. Quite interesting are how he captures the lights and shade, including several pieces of good advice on flowers as well. 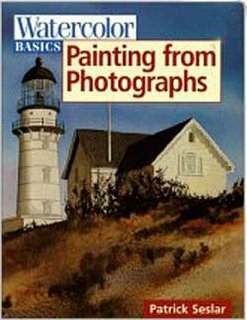 This is one of the few books which I think can help you understand the nuances of watercolour medium, especially if you paint quite a bit from photographs. Whether the photos serve as your references from stard till finish or as a complement to complete your outdoor sessions.